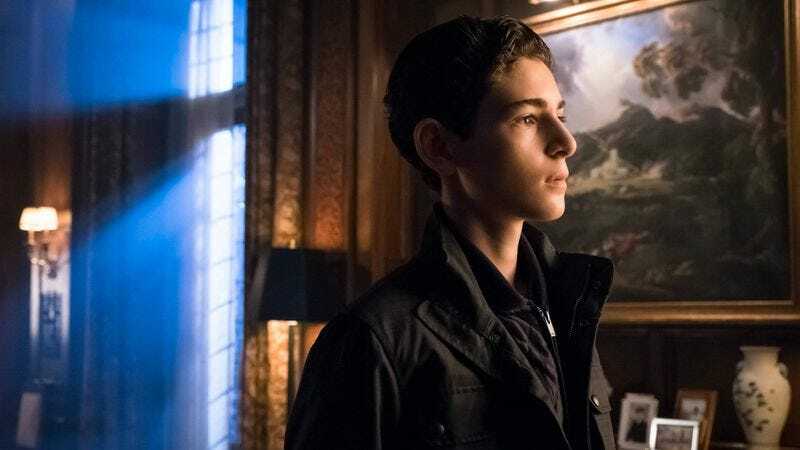 When Gotham aired its fall finale back in November, one of the biggest issues with the episode was that the crux of its dramatic tension was derived from the threat posed to Bruce Wayne by Theo Galavan. Galavan, up until that episode, had been a somewhat interesting character. His vision of total destruction in Gotham, aided by his run as Mayor of the city, brought a sense of clarity to a show that had often traded in case-of-the-week villains that boasted little staying power or genuine intrigue. Galavan felt different, like a person who could truly exploit the corrupt nature of Gotham’s bureaucratic, political and criminal systems. Then, Galavan went after Bruce in the fall finale because of an ancient blood feud and everything went off the rails because, spoiler alert, Bruce Wayne isn’t going to die. Now, every show has its protagonist who probably isn’t going to die, so in that sense Gotham isn’t much different. Where Gotham is different though is in the way it continually uses the safety of Bruce Wayne as a narrative device, no matter how unsuccessful it is. “Wrath Of The Villains: Unleashed” once again sees Gotham return to the exact same story that bogged down the fall finale. Theo Galavan, here resurrected as the ancient assassin Azrael, is on a mission to take down Jim Gordon before a timely run-in with his sister jogs his memory and he remembers that his original mission was to kill Bruce Wayne, the so-called Son Of Gotham. It’s a shame that Gotham chooses to go back to the well with Galavan and Bruce because Azrael is (was?) a promising character. Last week’s episode positioned him as a rather unstoppable force, only to have him fall this week at the hands of Cobblepot, Butch, and their rocket launcher. The campy fun of Butch and Cobblepot showing up to save Gordon and kill Galavan aside, the story falls flat. It’s actually baffling that Gotham feels the need to not only resurrect Galavan, but to then have him once again go after Bruce Wayne. “Unleashed” is nearly the same in structure and tone to “Rise Of The Villains: Worse Than A Crime,” meaning that the episode just feels like a coda that nobody wanted to a resolution we already received. What’s more troubling though is that Gotham takes the time to bring Galavan back as Azrael, and then have his memory jogged by his sister, only to never have him confront the man who killed him. Gotham spent a lot of time in the first half of this season, and part of the second half, musing on how the city and the job has changed Jim Gordon. The second half of this season has seen Gordon locked up for the murder of Galavan, broken out of prison, then removed from the GCPD and, I guess, cleared of the charges against him. But this is where Gotham‘s haphazard approach to storytelling is really exposed. After spending so much time hammering home the idea that Gordon is some sort of anti-hero, that he perhaps crossed the line and would have to deal with those consequences and the blurred line between being a good guy and a bad guy, the show just cruises past the resurrection of Galavan without even having him come into conflict with Gordon. What makes the show’s refusal to engage with the actual themes and storylines it set up so many episode ago even more frustrating is that there’s some good stuff peppered throughout the episode. Cobblepot is back to being his old self, which thankfully allows Robin Lord Taylor to once again ham it up and provide the show with some much needed gravitas. Then there’s the lighthearted aspects, like Selina and Nygma running into one another in the ventilation shafts of Arkham, or Bullock taking on a more substantial role this week and showing that this show really could work as a silly procedural if it didn’t take itself too seriously. Gotham is so overstuffed with ideas though that nothing ever feels complete or consequential. So, as good as it is to see the show embracing its campy qualities with Cobblepot and others, there’s still the sense that it’s all for naught. This goes back to one of the core issues with Gotham, and it’s something I’ve harped on again and again: consistency and balance. Gotham never commits to a tone, a story, or a narrative thread. If it did, Gordon wouldn’t be walking around like it’s no big deal to have the man he murdered in cold blood terrorizing Gotham in a leather and metal suit. If Gotham committed to meaningful character arcs, Galavan would be going after Gordon, not Bruce, and the whole episode wouldn’t come across as just a retread of the fall finale and so much of what came before it. The increased screentime for Indian Hill and Hugo Strange suggested a new direction for the show, but the resurrection of Galavan in “Unleashed” kills the momentum. 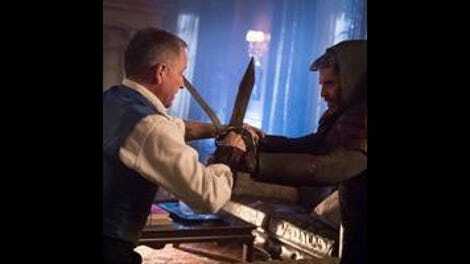 Essentially, “Unleashed” feels like Gotham clearing the table before the last few episodes. It resurrects old characters and subplots just to dispatch them again. “Unleashed” boasts some of Gotham‘s worst tendencies, which include a lack of dramatic stakes, an inattention paid to creating meaningful tension born out of clear character motivations, and a stubborn refusal to challenge the show’s protagonists in a way that means something in terms of either the overarching narrative or character progression. At this point Gotham is throwing everything at the wall, but nothing is sticking. If you had told me a year ago that Nygma would be one of my favourite characters on this show, I would have banished you from the comments section (if I had such power). Apologies for my presumptive R.I.P. to Barnes last week. Looks like he’s just in critical condition. Tabitha, as a character, used to have potential. Like the rest of the women on this show though, Gotham has tossed her aside. No matter how bad the Bruce Wayne stuff gets, I’ll still get a little misty whenever Alfred gets super protective of him.